Joe. My. God. 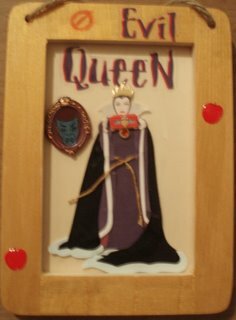 : Evil Old Queen. Birthplace Of The "Club Kid"
Thanks to everybody for all the birthday wishes yesterday. I celebrated by dragging my enfeebled, liver-spotted carcass into bed at 8PM, falling asleep before they even found the body on Law & Order. Celebration was made, however, on Sunday night, on my usual round of beer busts, where multiple shots of Jager were handed to me over the course of the night. One of the Farmboyz poured me into a taxi and gave the driver my address. I think. Yesterday, my sister's annual funhouse box of birthday presents landed on my desk. Amongst the Smarties, Animal Crackers, and t-shirts, were gifts from her kids, including this picture frame, made by my 5-year old niece in the preschool crafts class. "Happy bifhday, Uncle Joe. You are the Evil Queen. I can do a cartwheel." This kid, she learns fast.